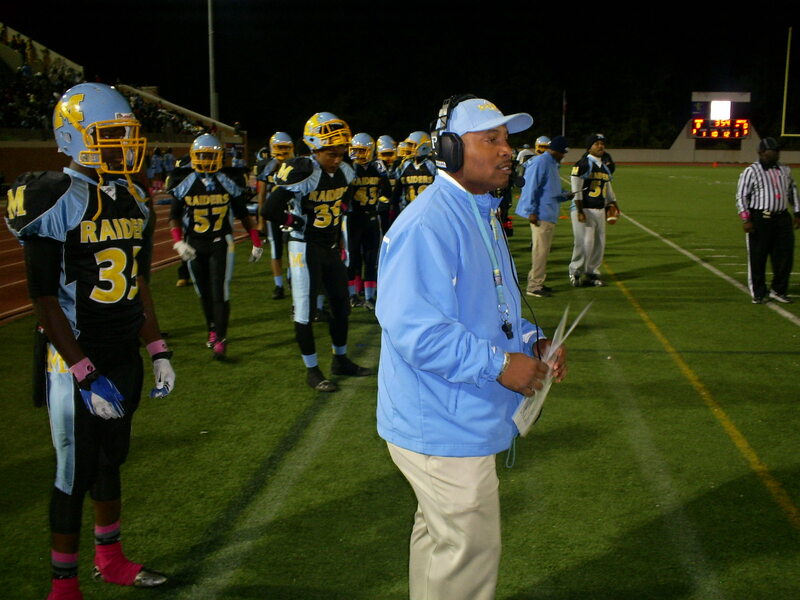 Corey Jarvis is out as head football coach at Mays High School. Late Tuesday night the Atlanta Board of Education accepted the Tribunal’s findings of facts and recommendation to terminate Jarvis’ employment in a 5-4 vote from August. An investigation launched by Atlanta Public Schools in January found more than $10,000 unaccounted for the Mays football program. More than $6,000 were in football receipts that were recorded by Jarvis that were untraceable and over $4,000 that was collected by him. In three full seasons at Mays, Jarvis posted a 30-9 record, advanced to at least the second round of the playoffs each season and were 2014 5A state runner-ups. In eleven seasons at M.L. King, Duluth and Mays he has compiled a 91-38 record, not including Mays’ 1-1 start this season. Jarvis had also served as the head track coach and had been on paid administrative leave since May. Mays (1-1) is currently under the direction of interim head coach Niketa Battle. The Raiders open region 5-6A play this weekend against Langston Hughes (2-0). The Mays Raiders knew what was in front of them if they wanted to play for a region championship, they had to find a way to beat region and state power Stephenson on the road Saturday night at Hallford Stadium in Clarkston, GA before they could think about Tucker next week. “We’ve played Jarvis before and we know he’s got some tricks tonight,” veteran Stephenson head coach Ron Gartrell said prior to the game. Jarvis was 1-3 against Stephenson in his five seasons at ML King from 2005-2009 and was outscored 70-27 in those games with the only win in 2006. After a rocky first possession that led to a punt and Stephenson scoring on an 18-yard touchdown run by Dallas Rivers for a 7-0 lead, they settled in and shutdown the Jaguars the remainder of the game. That run would be Rivers longest run of the game as he was bottled up by the Mays defense most of the night. Mays would be forced to punt on their next possession but the punt hit a Jaguar in the back and Mays recovered at the Stephenson 44 and were in business. After five straight running plays the Raiders went to the air and Ayinde Russell found Tyshawn Brown for a 26-yard touchdown pass to pull within 7-6 after the missed extra point with 4:37 left in the opening frame. Brown would strike again for Mays after the defense forced Stephenson to go three-and-out, Brown returned the punt 72 yards to the Stephenson 7 setting up Mays’ next score. Russell hit Julius Whitehead for a touchdown however Whitehead was flagged for illegal touching moving the Raiders back to the 23. On the next play Russell zipped in a 23-yard touchdown pass to sophomore Randercous Davis and Mays took a 13-7 lead after the successful extra point with 2:02 left in the first quarter. From there the Mays defense held the fort down with standout play led by Natrez Patrick (Jr), Marquez Daniels (So. ), Shiheem Rutherford (Jr), Roderick Tyler (Sr), Brandon Bradley (Sr), Jerome Smith (Sr) and Henry Whitherspoon (Sr). Mays would stop Stephenson on fourth and short on the Mays nine and again at the end of the half at the one to end a 15-play 97-yard drive in which Mays had 26 penalty yards including pass interference on fourth and goal from the two. “Defensively I gotta take my hat of to Coach [Lee] Hannah and my defensive staff and all the guys on defense because they played their butts off, they played lights out. We are young at certain positions but they actually are good ballplayers and they showed tonight they can shutdown a good team,” Jarvis said about his teams defensive performance. The second half featured a display of the punting units as the teams traded punts much of the half. Stephenson would find a way to score after a 54-yard punt was downed at the Mays one on their opening possession of the half. One play later Mays running back Romartis Bell was tackled in the endzone for a safety pulling Stephenson within four at 13-9 with 9:57 remaining in the third quarter. Mays pinned Stephenson at their own one after a punt in the fourth quarter under six minutes but three plays later Jaguar quarterback Dewann Ford scrambled, was hit and fumbled at the 21 and Mays recovered it. Again Stephenson would have another chance after Mays could not add points and were turned over on downs with 3:03 however Stephenson was turned over on downs with 1:37 to go and Mays would run the clock leaving Stephenson (7-2; 6-2) with only 15 seconds where they failed on two Hail Mary attempts from their own 35. Mays’defense was clearly the story of the the game as they played at another level and held SEC-bound running back Dallas Rivers under 100 yards rushing while not giving up backbreaking plays via the air and stopping Stephenson on several fourth down attempts. Yet the monkey remains on Stephenson’s back, what if they could have kicked field goals? The same goes for Mays as they missed an extra point and didn’t try a field goal late in the fourth quarter to pad their margin yet punted well enough to win. “Our kids took the gameplan and the motto that we were going to learn how to finish. They’ve fought to the end all year even in the two losses. Were young but were so talented and we showed our age by the little stupid mistakes we made but if we play our butts off we are going to stay in the ballgame,” Jarvis added. Mays (7-2; 7-1) enters their meeting with Georgia 5A top-ranked Tucker (9-0; 8-0) on Friday on a three game winning streak having lost by a combined four points on the season. Tucker and Mays will battle at 8pm at Lakewood Stadium for the Region 6-5A championship, the game time was changed from 5:30pm to 8pm EDT. Northside-Warner Robins had been ranked number one over Tucker in some polls but fell 28-18 to Warner Robins on Friday night. Mays should be ranked in the Top 10 come next week while Tucker should be nationally ranked no matter what rankings mean. In the end all Jarvis and Mays did was use good old school defense, no “tricks” seen all night. Arabia Mountain defeated a less than quality Southwest Dekalb (2-6; 2-5) 41-8 while Mays was polishing off a 40-8 win over Lakeside-Dekalb (1-7; 1-6) in Saturday Night Georgia High School Football action. Mays wasn’t concerned with Arabia Mountain, a team they fell to 32-29 in a game that featured a Mays rally falling up short. Arabia Mountain (5-3; 4-3) is still in the playoff hunt. Mays now sits 6-2 overall and 6-1 in region 6-5A with veteran Stephenson (7-1; 6-1) and two-time state champ world beater Tucker (8-0; 7-0) left on their schedule, both are region opponents. Mays head coach Corey Jarvis looks on as Mays defeats region foe Lakeside-Dekalb Saturday night. “We want to win region and we still have a shot,” Mays head coach Corey Jarvis said. Jarvis is in his first season at Mays yet went 12-18 at Duluth the previous three seasons in a nationally respected Region 7-6A in Georgia featuring North Gwinnett, Norcross and Collins Hill. Prior to the Duluth, Jarvis was 49-11 at ML King. Mays defeated ML King 36-28 earlier this season. The Jarvis Era was Duluth’s greatest run of success in recent years as they were 14-62 in the previous eight seasons since 2002. Lakeside-Dekalb used a more than 8 minute drive spanning the first and second quarters to knife into a 15-0 May’s lead to make it 15-8 in the middle of the second quarter on a 9-yard touchdown pass. Mays bounced back on their next possession scoring on a 3-yard touchdown run, set up by a 42-yard pass play for a 21-8 lead. “They threw some formations at us that we had not seen. We saw it and addressed it and were able to stop them as the game went on. They play in our region…,” Jarvis said. On Homecoming the Raiders impressed tacking on a touchdown near the end of the first half for a commanding 27-8 halftime lead. A 47-yard pass highlighted an 80-yard drive to open the 3rd quarter for Mays when they took a 33-8 lead at the end of that drive. They punched in another score to make it 40-8 for the final margin before the end of the third quarter, setting up a running clock for the fourth quarter. “We have to handle our business,” an already focused for next week Jarvis said. Corey Jarvis is still known at ML King (GA), he led them to a 45-11 record and one region title during his five years as the sideline boss. Add to that a 12-18 run in what many consider the toughest county for high school football in the nation, Gwinnett in three years at Duluth and well you have a pretty seasoned coach. “Bittersweet…I have history at ML King but this was good for our (Mays) program. I talked to the team this week about it and told them that we had to do it and we did,” Jarvis said after beating his former school the first time he played them. Mays is loaded with raw talent and lack game experience as any young and raw talent team does. The Raiders suffered a non-region 20-19 loss to Carver-Atlanta in their season-opener yet rebounded with back-to-back region wins over Miller Grove and ML King, both Dekalb County schools. Outside of the North Atlanta, Mays is the only team in Region 6-5A that is not in Dekalb County. “We could see they were getting tired and they made mistakes in crucial spots…we stuck to what we wanted to do,” Jarvis added. The Raiders had a plan for ML King’s highly-touted defensive standouts Arden Key and Wesley Green. Mays (2-1) is now 2-0 in the region with Southwest Dekalb (1-2) up next this week for what could be for a spot in the playoffs come early November. Region 6-5A is loaded with the likes of Tucker, Stephenson, ML King and the improve Miller Grove, Arabia Mountain and Mays. Arabia Mountain may not make the playoffs or contend for a region title but they could be the ‘fly in the ointment’ and win a game they have no business winning.